Présentation en anglais Britain underwent enormous change in the brief period from 1906 to 1924. Its constitution was altered in important ways with the reform of the House of Lords and the creation of the Irish Free State. At the same time, the first important steps were taken towards the modern Welfare State with the introduction of the first old age pensions and benefits for the unemployed and the sick, all of which constituted a massive revolution in the role of the state in British society. Such reforms were only won after the most contentious political struggles, which seemed at times to threaten a breakdown of the entire British political system. 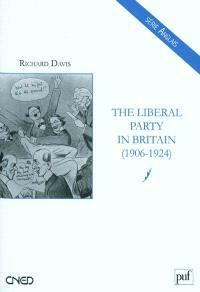 In all of this, the Liberal Party and the Liberal governments, from 1905 onwards, played the central role. Their achievements in office were considerable and, a century later, are still being looked to by some contemporary observers as a source of inspiration, none less than the present Liberal-Democrats who have returned to office in 2010 for the first time in almost 90 years. Yet, despite this impressive record, within the space of a decade from 1916 onwards, the Liberal Party was split between rival factions and leaders, whose personal animosities poisoned the party's existence for years to come. Ideologically, the Liberals had lost their way and no longer convinced the electors of post-war Britain. The party which had won a landslide at the polls in 1906 was, by 1924, reduced to a mere 40 seats in Parliament, one tenth of the number it had won, less than 20 years before. How and why this great party of the radical reforms of 1906-1914 collapsed in this way continues to fascinate students of this subject.